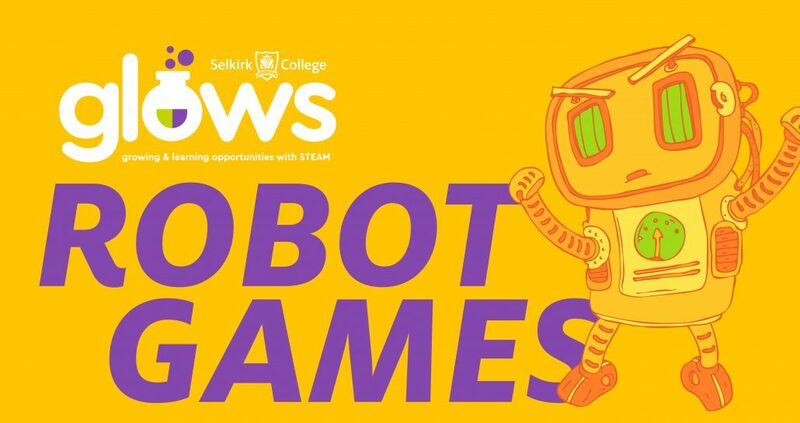 Selkirk College GLOWS RobotGames 2019! A robot competition like no other. Youth from throughout the region will build, program and deck out their robots to enter into RobotGames – a fun and free-spirited event full of prizes. RobotGames will take place Saturday, April 13 at the Tenth Street Campus in the Mary Hall Building. Everyone is welcome to attend! The Mary Hall Cafeteria will be open throughout the day or you can choose to bring a lunch! RobotGames is open to all youth ages 6 to 18 living in the West Kootenay/ Boundary region. No prior experience is necessary. Youth in teams of one to two people will prepare their robot for the ultimate competition event. Prizes include an iPod touch for the Balloon Popping Royal Rumble which everyone is invited to join. Other prizes will be handed out too! The Big Day! What to Expect?! Line following – This event utilizes the obstacle course, except you must follow the line from end to end. There may be crossed or intersected lines, as well as obstacles to create havoc. Speed and accuracy will be highly praised. The line will be about the thickness of the electrical tape. Your mBot kit comes with a simple foldout example for line following. Obstacle course – Your robot will need to maneuver the obstacle course as quickly and carefully as possible. Navigate walls and obstacles to reach the end of the maze. Robot battles – Two robots enter the open arena to compete as gladiators in the ultimate destruction event. Matches are limited to two minutes and judges will announce a winner. The last robot to make a meaningful hit, overall match polarity and gamesmanship will be rewarded. Robot soccer: One on one – Grab the most robot soccer balls to your side in two minutes. In the center of the obstacle course is a pile for both teams to grab from. Each team has a 24″ line parallel to the back wall laying claim to your teams’ captured balls. Balls knocked out of the arena will cost you points. Balls can be stolen over and over. Robots may store the balls in some manner but must release them before the clock runs out or they will not be counted in the final score. Special tricks – Think of something cool and crazy for your robot to do. Dance, tell a joke, fetch an object… use your imagination! Program your robot to do your evil, or not so evil bidding. No dangerous weapons, water, open flames or lasers allowed. Be creative, be awesome! Balloon popping – Which robot will pop the balloon first?! Enter the ring prepared to burst the balloon before your competitor. Make sure your robot isn’t dangerous in the process. Your aim is to pop the balloon and not your competitor. Learn more about GLOWS at Selkirk College and follow GLOWS on Facebook. Questions about RobotGames? Please contact Matt Martin. http://kast.com/wp-content/uploads/2019/03/GLOWS-RoboGame-1500px-2019.jpg 2750 5208 Tracy Connery http://kast.com/wp-content/uploads/2019/03/KASTLogo-2019-white-lo-1.png Tracy Connery2019-03-26 09:52:582019-03-26 09:54:03Selkirk College GLOWS RobotGames 2019!